We have always danced. As a people, a nation, a country, a culture, we have assembled and we have danced, be it for weather, war, fertility, socializing, prosperity, or self. We, in a word, dance. Dance gives us a means of expression, a connection to our culture, and within the different countries of the world, dance has evolved within the structures of its culture and according to the culture from which it was born. Egypt’s cultural expression through dance comes to us with many names. Presently known in many parts of the world today as “Belly dance”, Egypt has given us one of the most dynamic, yet misunderstood, expressions in the world today–“Raqs Sharqi”. As far back as 1400 BCE, girls are depicted dancing on the walls of tombs. One of the most popular illustrations of ancient Egyptian dance in any medium is a painted fresco from the tomb of Nebamun, an Egyptian "scribe and counter of grain" who lived during the New Kingdom and died sometime around 1400 BCE. Then King Amenhotep, who later renamed himself as King Akhenaten, the Heretic King, ruled with wife and Queen Nefertiti in the 1300s BCE. This was a time of artistic change and contribution and of productive building. It was also a time of religious change. As the pharaoh who declared that there was to be only one god, it is speculated that his wife Queen Nefertiti brought together all temple dancers and an Egyptian universal dance was born. These dances would continue to evolve throughout the ages passing down its core movements in a cultural expression to the native people of Egypt. Today, the West knows this dance as “Belly dance”. From around 1850 to 2000, Egypt saw the birth, rise, and transformation of its cultural expression through dance. With each period, a new energy in the dance was introduced and, with it, new dancers with new dance movements and new costumes. Below listed are the three major periods of the Golden Age of Egypt’s Dance Era with the three most famous dancers in each who reigned supreme. Of course, the dancers listed as the three most famous ones are only a few, but they comprise the total of nine of the most remembered and celebrated of all Egyptian dancers of their time known to the West. During this sixty-nine year period, artists, authors, and adventurers traveled to the Middle East and wrote about the exotic sights and sounds of the places to which they traveled. As well, the occupation by the English in 1882 brought out British troops who would later spend their time in local nightclubs watching the exotic dancers of Egypt. Out of this period came three celebrated dancers, Kuchuk Hanem, Shafika Al Cobtiya, and Badia Al Masabni. (Famed beauty and Ghawazee dancer of Esna, fl.1850-1870) is mentioned in two unrelated nineteenth-century accounts of travel to Egypt by the French novelist Gustave Flaubert and the American adventurer George William Curtis. Flaubert reports that she was from Damascus. She is remembered as a dancer with dance step known as “The Bee” or “The Wasp” where she is seen standing musing in a pensive posture until a buzzing insect flies into her clothing and she “flees” in terror, dancing rapidly, and removing articles of clothing in the manner of a provocative strip-tease. Described within the literature of this period and the sensationalized, eroticism written about her, Kuchuk Hanem — or “Little Lady” — underscores early misrepresentations of non-western women in the imagination of the West. (Shafika the Copt, 1851-1926) is remembered as the icon of the Oriental dance who became the most famous dancer in Egypt, after her teacher, Shooq, passed away during the turn of the century. She danced in the famous El Dorado Nightclub in Cairo and later opened her own, Alf Leyla Wa Leyla. She was the first to have danced with a candelabra on her head while playing finger cymbals (sagat). Sadly, Shafika Al Cobtiya suffered personal tragedies and eventually died of a drug overdose. A film released in 1963 starring Hend Rostom and Hussein Riad was made in Egypt, depicting the rise and tragic fall of the life of Shafika Al Cobtiya. (Mother of Oriental Dance, 1878-1970) is remembered as the owner and operator of Casino Badiya located on Imad El Din Street in in Cairo in the early 1900s during the influx of military personnel who began to patronize her establishment, enjoying the exotic dancing and music of Egypt. She was always a business-minded woman with an eye on the Hollywood movie magazines, often brought in to her by her Western and European clientele. Her keen sense and understanding of their Western Orientalist hunger, and an ear for her client’s wishes to witness what they thought a dancer should look like according to these magazine pictures (out of Hollywood), Badia Al Masabni gave her clientele what they wanted and designed the costume herself; thus was born what we now see as the traditional two-piece “bedlah” or Belly dance costume. Dancers in this era were not documented but one named Shooq was recorded. During this period, Egypt was introduced to the film industry. Dance and music talent soon dominated the silver screen with many of the dancers we know of today. The three most celebrated dancers of this period were Taheyia Karioka, Samia Gamal, and Na’eema Akef. Taheyia Karioka (Queen of Oriental Dance, 1919-1999) is remembered for elevating the dance to the level we enjoy today and for being the first dancer to appear with significant story lines and dance performances in numerous Egyptian films. Thus, she opened the doors to other aspiring dancers and made it possible for them to enjoy the same success she attained as a movie actress and star, as well as a highly respected and sought-after dancer. (National Dancer of Egypt, 1924-1994) is remembered for bringing flair and energy to the dance by establishing and setting a trend for fashion design in her dance. She performed in costumes unlike the ones that were traditionally worn at that time, and was the first to dance with high heels during her performances (setting yet another trend for footwear outside the traditional slippers or bare feet). (Premiere Star of the Egyptian Musical Cinema, 1929-1966) is remembered for the grace and beauty she presented in her innovative performances, coupled with her angelic voice, (influenced by her circus upbringing) that provided a strong foundation for her unique, theatrical, and sometimes, balletic dance choreography. Thereby, she introduced yet other elements of performance to the dance arena including the elements of ballet and theatrical choreography–entirely new concepts for her time. Dancers included (but not limited to in this era) are: Na’amet Mokhtar, Samiha Tawfiq, Zinaat Aloui, Katie, Hoda Shams El Din, and Nebawiya Moustafa. The Egyptian revolution of 1952 brought changes to Egypt, and thus, subtle changes to the dance. In the 1960s, Nagwa Fouad, Suhair Zaki, and Fifi Abdo led the charts in the dancing entertainment world. (Princess of Cairo, 1943-Present) is remembered for her graceful arms, flowing chiffon veils and outlandish performances. Her biggest fan was Henry Kissinger who visited Egypt 11 times and always requested Nagwa to perform for him during his visits as did America’s President Carter who visited Egypt with his wife. (The Oum Koulthoum of Dance, 1944-Present) is remembered for having become the first Oriental dance artist to do a performance to a song that had been made popular by the great singer Oum Koulthoum. Following her lead, every Oriental dance artist today is expected to have at least one Oum Koulthoum song in her repertoire, among others. She is remembered also for her distinctive hip and hand movements. (The Queen of Shimmy, 1952-Present) is remembered most for her strong shimmy, exciting cane technique, and her energetic performances for the famous actors and musicians award dinners in Egypt. She is the first to have used a hooka (or shisha) in her performances. Dancers included (but not limited to) in this era are: Nellie Fouad, Hanan, and Mona El Said, Hayatem, Hala El Safy, ShooShoo Amin, Aida Noor, Azza Shireef, Lebleba, Zizi Moustafa. 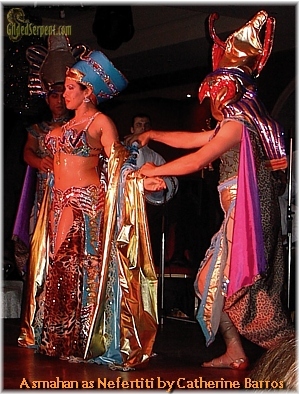 Belly dance during the the three major periods of the Golden Age of Egypt was flamboyant, expressive, and lively. In fact, the dancers who danced in the chorus lines behind a solo dancer danced with individuality, unlike what we are used to seeing in the West. Egyptian group performances did not resemble the chorus line of a Las Vegas show or of the Ziegfeld Follies, but rather, a vivacious group of women dancing with energy in a like manner (but with evident individuality and gusto) employing a general choreographed dance. Around 1990, with the onset of technology (and the ability to access it easily and readily) the energy began to shift again, and new dancers emerged, vying for the limelight. In 1992, National Geographic set out to produce a program called “Cairo Unveiled” on a day in the life of one of Egypt’s Belly dancers and the world was introduced to Lucy. It is said that Fifi Abdo’s publicist was asleep at his post and was soon fired after this interview was released. Although Lucy attained notoriety almost overnight, Fifi Abdo continued to light up the marquee up until the end of the Twentieth Century along with a new young dancer named Dina. The three dancers became known as the “The Big Three” with Fifi Abdo leading the team as “The Best of the Big Three”. At the turn of the century, the dance began to evolve, incorporating a more Western look and feel, but still maintaining the cultural Egyptian feeling. Dina’s reign on the dance floor began in earnest during the 2000s. She is still a major dancer in Egypt today, with new celebrated dancers including Asmahan, Saroya, Randa Kamal, and Dandesh and others who enjoy the limelight and perform for tourists and travelers alike. Has the Islamic religion oppressed belly dance? Is the culture of belly dancing disappearing in Islamic countries? Where is the oppression occurring the most in what countries?